The aerial part of perennial herbaceous plant Pogostemon cablin (Blanco) Benth. of .family Labiatae. Guangdong and Hainan provinces, etc. in China. Dry, orderliness, green cross section, soft and fat leave, strong fragrant. Dried in the sun, cut into segments and unprocessed. Pungent, slightly warm; spleen, stomach and lung meridians entered. Resolve dampness, arrest vomiting, release exterior. It is the essential herb for resolving dampness, because it is aromatic in flavor, warm but not heat, dry but not drastic in nature. So it is commonly used for dysfunction of spleen in transformation and transportation due to damp obstruction in middle energizer manifested as gastric and abdominal distention and fullness, poor appetite, nausea, vomiting, diarrhea and dysentery, etc. It is slightly warm in nature, so it is suitable for the syndrome of cold-damp harassment of spleen; at that time, it is combined with the damp-drying and qi-moving herbs. For instance, it is combined with Cang Zhu, Hou Po and Chen Pi in Bu Huan Jin Zheng Qi San from Tai Ping Hui Min He Ji Ju Fang. It is the effective herb for vomiting and indicated for all types of vomiting, because it can not only resolve dampness but also arrest vomiting. For its main action is resolving dampness, it is more suitable for vomiting due to damp-turbidity obstruction in middle energizer. For failure of stomach qi to descend due to cold-damp harassment of spleen manifested as vomiting, it is usually combined with the stomach-warming and vomiting-arresting herbs. For instance it is combined with Ban Xia and Ding Xiang in Huo Xiang Ban Xia Tang from Tai Ping Hui Min He Ji Ju Fang in He Ji Ju Fang. For vomiting due to obstruction of damp-heat in middle energizer, it is usually combined with the stomach-clearing and vomiting-arresting herbs such as Huang Lian and Zhu Ru. For nausea and vomiting due to deficiency of spleen and stomach, it is combined with the spleen-stomach-invigorating herbs such as Dang Shen and Bai Zhu. For pregnant vomiting due to damp obstruction and qi stagnation, it is usually combined with the middle-energizer-harmonizing and abortion-preventing herbs such as Sha Ren and Zi Su Geng. 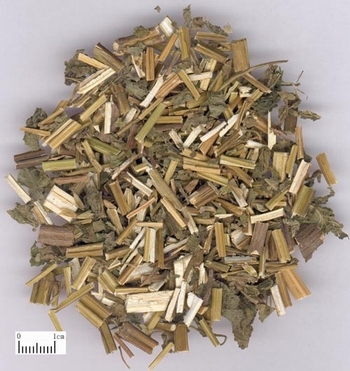 It is the essential herb for chills with fever, headache and body pain, gastric and abdominal fullness, nausea and vomiting due to affection of exogenous wind-cold in summer and retention of dampness and cold in interior for its actions of dispersing wind-cold from exterior and resolving damp-turbidity from interior. It is usually combined with the damp-resolving an exterior-releasing herbs. For instance it is combined with Zi Su, Hou Po and Ban Xia in Huo Xiang Zheng Qi San from Tai Ping Hui Min He Ji Iu Fang. For the early stage of the syndrome of damp-warm, it is usually combined with the heat-clearing and dampness-draining herbs. For instance it is combined with Huang Qin, Hua Shi and Yin Chen in Gan Lu Xiao Du Dan from Wen Re Jing Wei. Decoct 5~10 g, the dosage of the fresh is doubled.